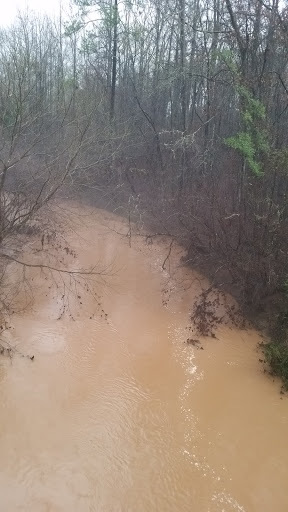 When we arrived at my brother-in-laws (BIL) on Sunday, we drove over to our land and the creek was the lowest we have ever seen it. By yesterday afternoon, the sandbars that reached half way across were completely covered. We drove out to the road that runs to the north of our property and the water there was moving at about the speed of the Nantahala River down by the outdoor center. It continued to rain heavily all night and we’ve been intermittantly under tornado watches. As we reach every time point that the forecast claimed the rain would end, the forecast changes. By lunch time today, the creek was higher and moving really quickly. We were going to walk over to the spring that runs between where we plan to build the house and where we plan to have the garden, but the rain started coming down by the bucket-full again and our phones reported lightning strikes .3 miles away. 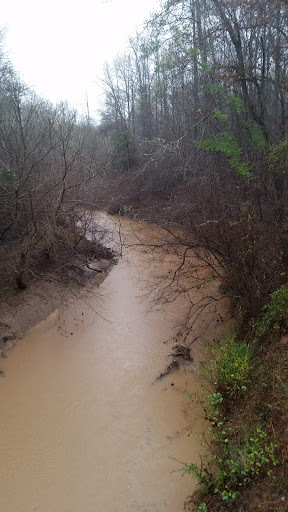 We really want to see what the spring looks like with this kind of rain, and we want to see what the creek looks like at the back of the property, but not enough to walk in a downpour and risk being struck by lightening. The other things that the rain has delayed are getting BILs hot water heater installed and working on our RV. We got a great deal on an RV that had been used as a hunting cabin, but it does have some leaks. That’s one good thing about this rain — we think we know where ALL the leaks are now. At some point, someone adding paneling over the original wall and put in new flooring, but that person didn’t actually fix the leak or tear out any of the damaged wood. Right now, the entire RV is covered with a tarp (Tractor Supply has a great selection of huge tarps) and we have most of the bedroom gutted. We’re confident that we can get a waterproof and mold-free room fairly quickly — so long as this rain actually stops at some point. 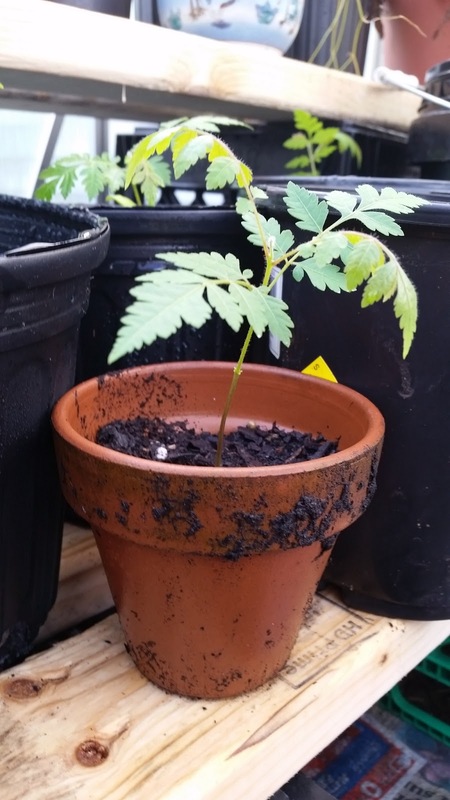 Harvesting and planting Goldenraintree seedlings worked far better than I thought, and the seedlings have thrived in the greenhouse. Some are now 6 inches tall, while others just sprouted within the past few days. As I didn’t anticipate so many of the seeds germinating, I put 2 – 3 seeds in each 1″ by 1″ compartment and ended up with zero to three seedlings in each tiny space. I was reluctant to disturb them at this time of year, but roots were already shooting out of the bottom of the pots and leaves were competing for light. I was really worried about the bare roots below the pot and the thin layer of soil between the roots and the environment as we do not yet know how the greenhouse will perform when temperatures really drop, so I decided to transplant them into bigger pots. I thought my husband was a little crazy when he ordered flower pots in bulk at the end of summer, but I have now filled every 1 gallon pot! 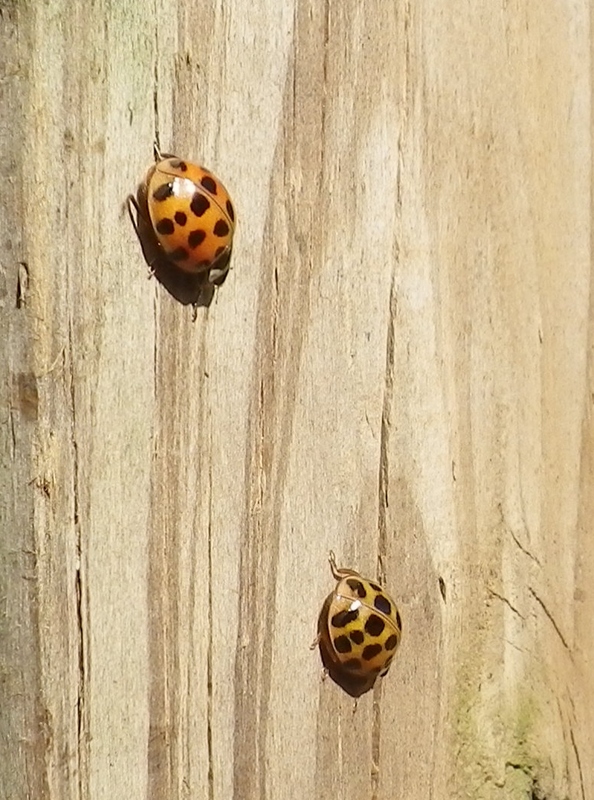 (Well, I still have one, 1-gallon pot, but it doesn’t count because it’s full of spider webs and therefore unusable until hubby evicts any squatters.) 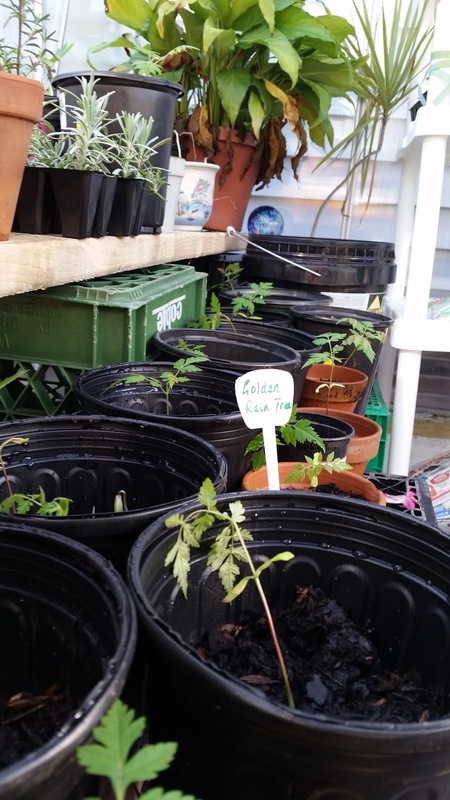 I first used all the smaller pots I had lying around for my treelings, and the last few seedlings are sharing a pot with two neighbors. If they all survive, we will have 32 beautiful trees to plant on our land. The bag of garden soil I used was dry on top, but a smelly, swampy mess on the bottom. I ended up pouring the bottom third into two large planters to dry out. When I was potting day-lilies a few weeks ago, I read that adding hydrogen peroxide to water or even rinsing the root ball with the solution can prevent root rot and fungal infections. As all of the daylilly transplants are doing well, I watered the seedlings with a weak solution to eliminate any problems that the questionable soil might carry. While skimming the article linked above, I also learned that oxygen is released directly into the soil as the hydrogen peroxide breaks down, which encourages healthy root growth. Everything is thriving in the greenhouse and the lowest temperatures are staying about 5 degrees above the overnight outdoor temperature. We have a light plugged into a Thermocube that is supposed to automatically turn on when temperatures fall below 35 degrees, but has not yet turned on even when the thermometer recorded a low temperature of 33.8. I re-positioned the cube yesterday to a location where cold air enters around the power cord, but where it is also not placed where it will get watered along with the plants. If we don’t see it turn on before our next trip to the land, I’ll use a timer to just run the light every night. A 60 watt bulb in a reflector kept the greenhouse at 45 degrees on a recent 32 degree night, and I don’t think we’ll have to worry about any 90 degree nights for a while, so that might be the safer solution. Still…. I want to find out if the thermocube will kick in, especially as I recommended it to my brother-in-law as a way to keep temperatures above freezing in his well house. Maybe I’ll put some ice cubes in a zip lock bag and see if I can get it to turn on that way…..
After a trip to the greenhouse in my pyjamas and winter coat, the bad news is that a bag of ice is not working. More tests are required before I write-off the Thermocube as it received great reviews on Amazon, but I will hook up a timer until my doubts have been allayed. The good news is that my transplanted seedlings are doing well. As I stood in line to pay for my neoprene boots at Tractor Supply Store on Black Friday, the dulcet tones of O, Holy Night wafted through the air and transported me back to the evening before, listening to a conversation about the life I married into almost eleven years ago — that of military spouse. Put four Army Rangers around a campfire, and conversation will inevitably turn to tales of the highs and lows of training. Never combat. Always training. And tales of less-than-ideal parachute jumps are inevitably punctuated with varying degrees of profanity. But in a way, these harrowing stories and colorful language have become dulcet to my ears because many of the stories are now so familiar to me and each of the voices has underlying tones of mutual respect and the bonding of shared experience. Listening took me back to holiday evenings of my childhood spent sleepily listening to the steady and comforting hum of aunts, uncles, and my parents talking in soft voices. That combined with staring into a camp fire made it impossible to think of work, and my stress drifted away on the curling smoke of the fire. I was an outdoorsy kind of girl long before I met my husband. As a child, I never saw the point of staying at home playing with dolls when there were trees to be climbed or woods to explore. The freedom I felt wandering through the pastures and woods of my childhood and the connection I felt to my father when “helping” him string a fence or tend the vegetable garden are so strong that I still feel more at home in nature than at a party of any kind. My poor mother spent 50 years trying to turn me into a lady, and all she got was a rebellious tomboy in hiking boots. Now that we are back in the city, I long for the country. The evenings around the camp fire — one with army guys, one with our daughter — were the epitome of my ideal life. I’m not thrilled about the possibility of running into another rattlesnake, but the woods are still where I feel at home. Last weekend, during one middle-of-the-night trip to the outhouse, I looked up in awe at the stars and forgot why I was outside in the cold — or even that it was cold. On our last morning there, another outhouse visit presented me with an opportunity to see an incredible sunrise. Memories of my 2:00am encounter with a hissing possum make me laugh. Don’t get me wrong — I want indoor plumbing in our retirement house, but I also want the chance to pause life and star gaze. That is my holy night. That is where I feel closest to God.